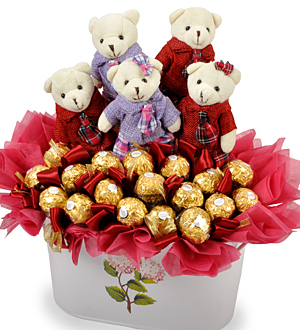 Sweeten someone's heart with a pot of Ferraro Rocher 18pcs and a cutesy bears 5pcs. Free delivery applies for order within Klang Valley (Kuala Lumpur, Petaling Jaya, Selangor, WP) only. For outstation delivery within Malaysia, additional charges apply and at least 2-3 days notice required.